As a housewife how to be lazy in the holiday season? For me I do things ahead. Dumpling filling, done. Christmas cookie dough, done. Pie crust, done. Fruit conserve in jar (as gift), done. So I have nothing to fuzz on the Christmas Day. But lazy or busy, I always have a moment for coffee and dessert. 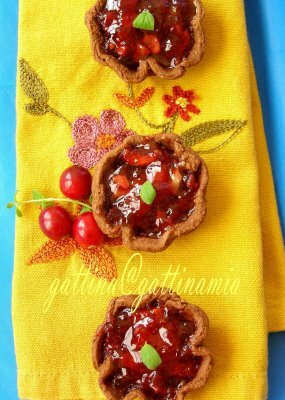 Glad that things done ahead, these tartlets and pie arrived on table in 30 minutes (please put your feet in my mouth if I start saying yum-o *LOL*). The crust recipe's from Ilva. 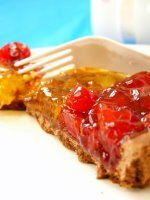 This crust is chocolate-y but not so buttery like shortbread; it's probably not the type you like to eat on its own but definitely the one lets any sweet and gooey fruit filling stand out better. What filled inside now is cranberry conserve, go check out what a gorgeous one Sher made! I'm still gasping! So here they come; bitter (chocolate crust) and sweet (conserve) are made for each other. Recipe of cranberry conserve: please use this recipe from Sher at What Did You Eat? 1+2/3 cups unbleached flour, 5 Tbps Dutch possessed cocoa powder, a pinch of salt, 3/4 tsp baking powder, 4 Tbps vegetable shortening, 3 Tbps butter, 6+1/2 Tbps sugar, 1 egg, spoonful of water. In another mixing bowl, beat shortening, butter and sugar until light and fluffy. Add egg to coporate. Combine the flour mixture with the butter mixture to form a dough. Add little water if necessary, only a spoonful at a time as we aren't looking for wet dough. Wrap the dough and rest it in fridge for half an hour. Roll it to 1/2 cm thick (less thick for tartlet), in between you should rest the flatten dough in fridge again whenever it resists to spread out. Cut it to fit your pie and tart pans, wrap and rest them in fridge again for half an hour, the purpose is to allow the gluten in the dough totally relax so it won't shrink back and is able to keep the shape during baking. In this stage, you can freeze the dough for later use, or store them in fridge for 1 or 2 days. Fill the dough with conserve... and I dress up the round pie with two different fillings: cranberry conserve and marmalade. Bake in a 350F oven for 30-40 minutes for the pie, 20 minutes for the tartlets. Enjoy this holiday, my dearest friends! 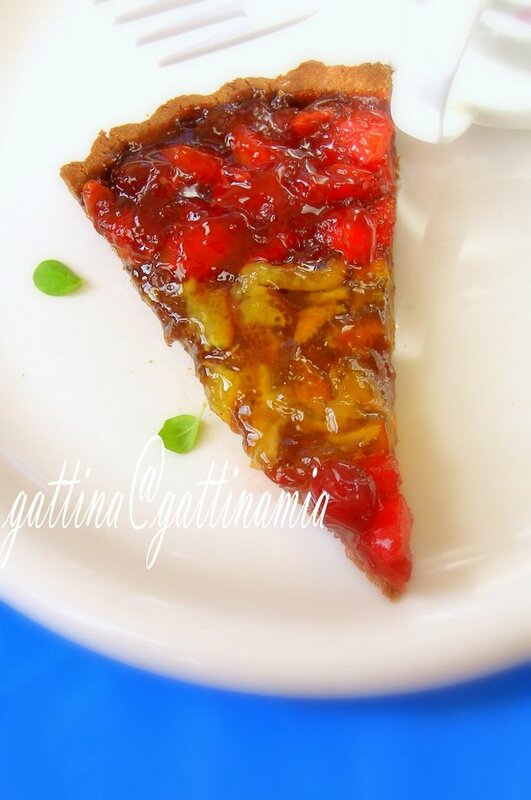 Gattina, I like the duo combo of cranberry conserve and marmalade. I'll be right over for that cuppa coffee and tart. Delicious! And festive-looking. I like how you're so organized and have many things done. Wonderful! Love the colors. Really nice combination. Gattina, my dear, you are so talented I wanna cry! This pie looks amazing - I love the combination of chocolate and fruit. I'll check out these blogs you mentioned later, I don't now them yet. 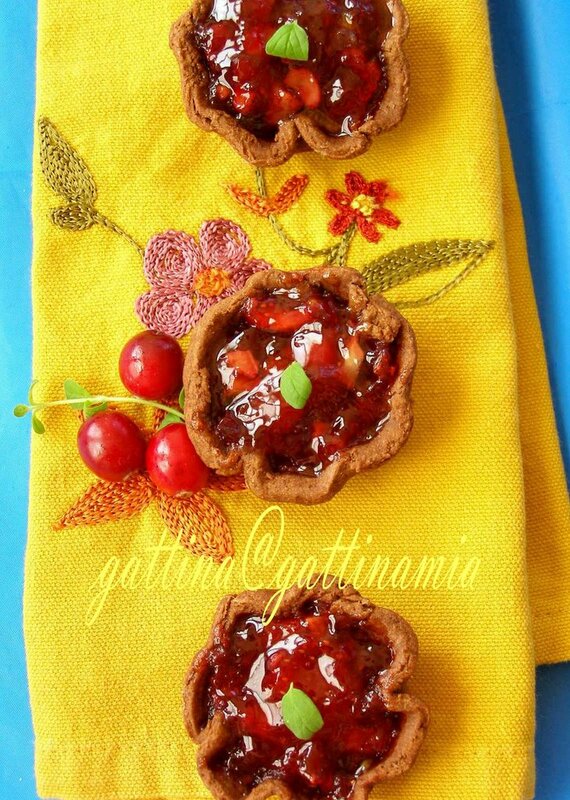 Gattina, these tarts are so beautiful! Love the colors in the pics, too! Very warmy and festive! I have loads of admiration for people who are organised. Something I can never master. Pie looks fantastic! Beautiful tart, Gattina! I love the orange with the cranberry =) I also love how you combined Ilva's recipe with Sher's recipe.. very nice =) Happy holidays! 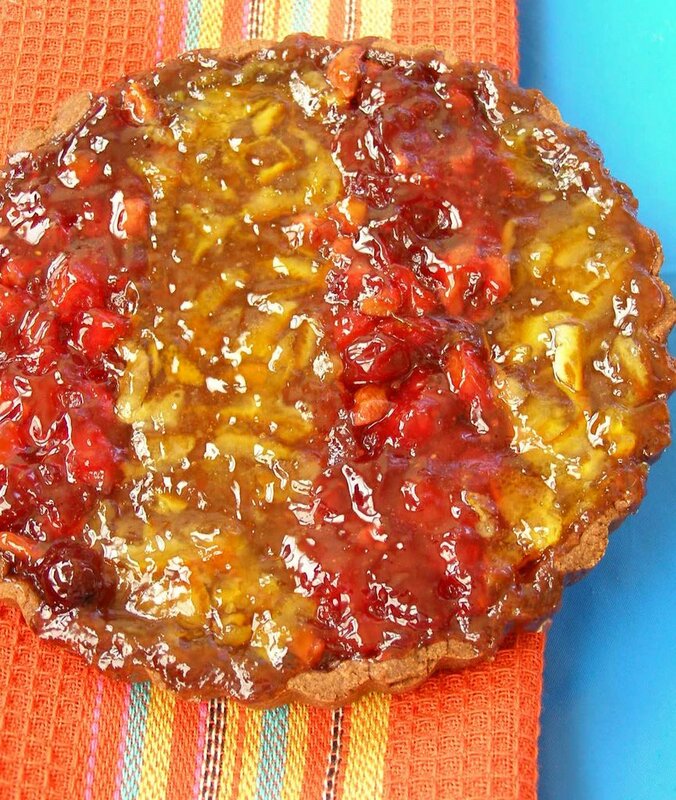 That is an absolutely beautiful tart and the colours are perfect for the holidays, well done! It's so lovely! The colour, the patterns, everything is beautiful! I love embroidery and my dish towels were cross-stitched by me. Callipygia, coffee and tart, another bitter+sweet marriage, I like! Bea, thanks for your compliement! Asha, hehee... got it tomorrow, will be right there! Brilynn, happy holiday to you sweetie! Patricia, yes, please check their blogs out, you'll love them! It is a store-bought kitchen towel in that photo, the embroidery seems done by machine to me, imported from India. India makes a lot of amasing garment stuff which all are gorgeous! I admire your talent in cooking, and now add one more, cross stitching! But I have no single ounce of talent in it; please show the work of art of yours... only if you have time! And, my heart-felt thank you for all the sweet words! again another nice recipe and healthy too..As I feel, canberrys are good for health. Gattina, they look so beautiful. 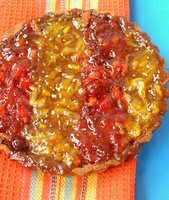 Oh I've been too busy to check my blogs each day and now I see these wonderful pies and tarts you made with the conserve. They are truly gorgeous. I think magic runs in your hands because you always manage to make things that take my breathe away. Thanks for mentioning me and transforming my humble cranberry conserve into something so beautiful. yum o indeed.. nice combination of sweet and sour. and what amazing pictures. so where is the recipe of the preserves? Meena, right, cranberry juice I think very delicious too. Lakshmi, wish you a merry Christmas! Sher, I know you should be very busy with Upsie, really don't worry about it! Merry Christmas buddy! Shaheen, thanks to remind me, I should have put a note telling you guys please go straight to Sher's post since she writes the recipe so well. Will add it soon... and thank you so much your compliement! gosh these looks absolutely delicious!